Frederick Low was born on his father’s farm near Frankfort, Maine. At age 15, he became apprenticed to a mercantile company in Boston called Russell, Sturgis and Company. While in Boston, Low attended many of the lectures given at the Lowell Institute and Faneuil Hall. He heard many noted scholars including Frederick Douglass, Oliver Wendell Holmes, and Ralph Waldo Emerson. In 1849, Low headed to California in search of gold. In a few short months, he earned over $1,500 in gold. Low returned to San Francisco where he and Henry Lambert opened a general store. In 1850, he dissolved his partnership with Lambert and moved to Marysville. A year later, he and his two brothers began a mercantile and shipping business. In 1854, along with five partners, Low organized the California Steam Navigation Company, a large river navigation company. 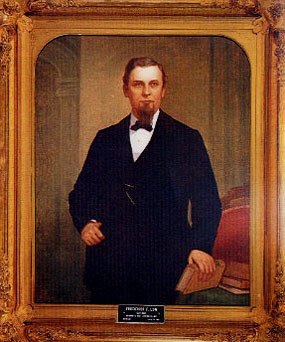 Low’s career in politics began when he was considered for the Republican candidate for state controller in 1861, but was not selected. Later that same year, Low was one of three congressmen-at-large for California who won a seat in the U.S. Congress. In 1863, President Lincoln appointed Low as the Collector of the Port of San Francisco. That same year, Low was elected Governor. Some of Low’s greatest achievements during is term in office were in education. During his tenure, public school attendance increased. Low encouraged the development of a state university system and the use of land grants to promote higher education. Looking back on his term of office, Low said, "There's not much chance to display one's ability in the governor's office of this state, even if you be brilliant." After leaving the governor’s office, Low was appointed the Minister to China by President Grant. He served as the Minister to China from the end of 1869 until spring of 1874 when he resigned his post. Later in 1874 Low served as the Manager of Anglo-California Bank, a position he held until 1884, when he became president of the San Francisco Clearing House Association. Use the California State Library’s interactive tool to view Executive Orders and Proclamations signed by Governor Low.